Businesses big and small alike need a website as a medium to communicate with its existing and potential customers as well as business partners and employees. Businesses gain credibility through a good website. A good website can save a business a lot of advertising costs as well. Traditional advertising mediums like print and television have space and time constraints. A website on the other hand can share as much information as a business would like with no time constraints. The goal of a good website is to be attractive to relevant traffic and engage the user until the user takes the desired action or converts; whether the action is to buy a product, complete a form, call the business, download something or to simply keep the user engaged to absorb your businesses content. Necessity Marketing offers web design services in Miami and to businesses across the country to solve their website related needs. We build websites that are technically robust and aesthetically attractive. Along with website development we also have other services such as search engine optimization (SEO), social media optimization (SMO) and search engine marketing (SEM) that can drastically increase your website traffic and lead to business growth. Our developers are proficient in many coding languages. We work with many of the top eCommerce cart platforms as well. We strive to design and develop user friendly robust websites that are technically sound and responsive across all devices. Here are some of the platforms we work with. PHP gives more design and development flexibility than C, C++ and ASP. Overall this flexibility aids in creating a user friendly site which will increase conversions. WordPress combines simplicity for users and publishers with under-the-hood complexity for developers. Magento provides feature-rich eCommerce platforms (Enterprise and Community) that offer merchants complete flexibility and control over the presentation, content, and functionality of their online store. Opencart offers a robust number of settings that can be utilized in effectively merchandising products, offering discounts and promotions at the product level as well as the capability of creating an in-house affiliate program. Shopify is an eCommerce platform with the capability to automatically generate sitemaps.xml files so new products and site changes are easily indexed and show up on search engines like Google, Bing and Yahoo quickly. Shopify is scalable and offers a number of plugins to aid in the growth of your online store. Ruby on Rails is a framework that is budget friendly and allows for fast development. This framework is light and fast which makes it great for fast load times on tablets and mobile devises. osCommerce helps merchants develop and grow their customer base by being customer focused and easy to use. This platform provides many extras to aid in these efforts such as reviews, newsletters, and the email a friend feature. 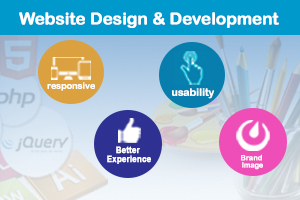 Designing and development of a website depends on the needs of the business as no two are the same. For example if you run a brick and mortar store in Miami, web design could be a simple HTML website having basic necessary elements like your businesses: introduction, products and services, contact information, and important call-to-actions. If you are selling online along with the physical store location your web development needs to have more dynamic features such as a content management system, shipping, payment, gateways, etc. With technology constantly advancing it is easy for people to browse the internet on mobile devices like smart phones and tablets. A Good website should be visible and fit any of the screens on any of these devices to ensure a good user experience and ultimately have the user reach the desired action or conversion. Similarly the designing needs of different websites also differ based on the type of business that is being done. For instance if the business is a travel agency based in Miami, web design should have an exotic look and feel with suitable pictures and backgrounds to inspire potential customers to want to travel and use the agency. In contrast it would be good to have a simple, neat and professional web design for a Miami based B2B business selling industrial products. Website design templates are usually industry specific helping ease the choices for design options for some businesses. Others may need very creative and out of the box concepts for their website designs while others may desire to convey their story, vision or customer proposition through their website design. The website is the first selling point of your business. It is a place where you can meet your potential customers for the first time. If your website doesn’t speak at that time, you can easily lose potential customers.There is fierce competition in the online space. To be competitive, your business needs a good website that incorporates the best website design and usability for your potential customers. Necessity marketing is a leading web design company in Miami, Florida. When first speaking with potential clients it is important that we get to know and understand your business. This allows us to suggest various design and development ideas to help achieve your business goals. Based on your feedback we can then offer the best website designing solution for your business. We develop responsive websites using the latest technologies and host them on secure platforms. We look forward to hearing from you and discussing how our web development and design services can grow your business. Contact us now for a no obligation consultation and analysis.